"Adams Manufacturing 8129-48-3750 Umbrella Base, White"
Color: Black. Net Weight: 20 lbs. Diameters of Upright Tube: 2 3/16" Dia.. Overall Size(Dia. x H): 17 15/16" x 12 13/16". Fit for 8ft or 9ft Patio Umbrella. Click for Full Description. Best Choice Products 4-Piece Cantilever Offset Patio Umbrella Stand Square Base Plate Set w/ Easy-Fill Spouts - Black. Keep your offset patio umbrella secure with a functional and durable base. Each plate can be filled with water or sand, creating a heavy and firm foundation that will keep your umbrella on the ground. Constructed Of Durable Envirostone That Won't Stain Your Deck Or Patio, 100% Rust Free. 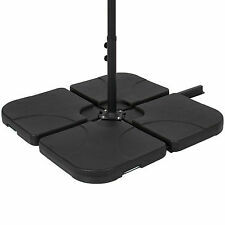 18" Black Umbrella Base Stand. 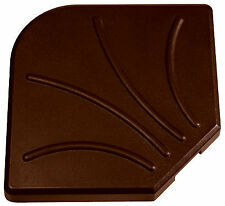 This Is Our 17.5" Square Umbrella Base, Which Is Ideal For Holding Your Umbrella Securely And Evenly In Place. It Is Really A Practical Addition To Your Backyard Or Your Patio Area. Holding Your Umbrella Securely And Evenly In Place. SIMPLISTIC DESIGN: This 4pc base set is suitable for offset and cantilever umbrellas as well as market umbrellas, and can be used in residential or commercial settings.|LARGE CAPACITY: Each fillable base piece can hold approximately 13 Liters of water or 28 pounds of sand. For best results, we recommend filling with dry sand and then adding water to increase the weight.|HEAVY DUTY BASE: The package includes 4 separate base pieces that fit together over the crossbars of your umbrella stand to keep it stable and secure.|STURDY MATERIAL: Made of strong and durable HDPE Plastic with a weather resistant and UV protective coating, this base is perfect for outdoor use.PACK OF 4: One package with 4 base, suitable for all kinds of cross tile, ideal for commercial and residential use.|EASY TO USE: E.
BCP SKU: SKY4683. 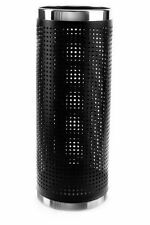 Best Choice Products 38.5lb Steel Square Patio Umbrella Base Stand w/ Tightening Knob and Anchor Holes - Black. Secure your patio umbrella with this heavy-duty steel tube base. It's also durably crafted with a powder-coated finish to resist scratching, peeling, and more. (Fit for 8 Ft 9 Ft or 10 Ft Patio Umbrella. Heavy base holds umbrella stable and safe. Attractive elegant rose decorative pattern and antique finish. x H): 19 1/2" x 13 3/16" (49.5 x 33.5cm). Upright Tube Dia. : 2 3/16" (55mm). Best Choice Products Wicker Rattan Patio Umbrella Stand Table Outdoor Furniture for Garden, Pool, Deck - Brown. BCP SKU: SKY2475. Take in the breeze and stay cool in the shade of a patio umbrella as you eat and drink with friends! Its brown, rust-resistant finish will coordinate with most patio dining and bistro tables with umbrella holes. 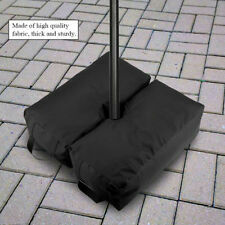 Use the easy tightening knob to secure your patio umbrella pole to the base (not for use with freestanding umbrellas). It Is Really A Practical Addition To Your Backyard Or Your Patio Area. Holding Your Umbrella Securely And Evenly In Place. Cast Iron Construction. Material: Cast Iron. Round Base Size: 17 3/4". Beautiful Decorative Pattern And Bronze Finish. HEAVY DUTY SUPPORT: Heavy-duty 4-plate base weight set strongly supports your offset patio umbrella stand ensuring that it doesn’t blow away in the wind.|DURABLE DESIGN: Made of durable HDPE plastic with weather resistant and UV protective coating making it ideal for continued outdoor use.|CONVENIENT SPOUT: An easy fill spout creates a quick and convenient way to fill and clean your base weights.|CARRYING HANDLE: A built-in carrying handle provides an easy and convenient way to transport.|LARGE CAPACITY: Features a large capacity space with each plate holding 15 liters of water or 200 pounds of sand. BCP SKU: SKY4527. Complete your patio umbrella with this simple yet stylish base. This stand is designed to keep umbrellas secure while adding elegance to any outdoor living space. 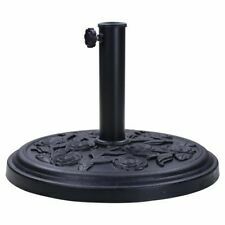 Best Choice Products Plastic Fillable Patio Umbrella Base Stand Pole Holder for Outdoor, Lawn, Garden - Black. THE SIZE IS 2 1/2 X 2 1/2 X 39". 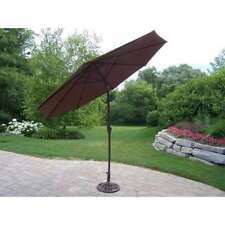 Windy weather is no longer a problem with this sturdy, ergonomically designed patio umbrella base. 1x Umbrella base sand bag. Each bag can bear 45 KG (99 lb) without filler. And fillers can be self filled with sand, buckwheat and so on. As a practical addition, this Outsunny Umbrella Base with Stand goes great in your backyard or in your patio area. Just combine your umbrella with a table and chairs to create a relaxing oasis. It holds your umbrella securely and evenly in place, so the umbrella can provide much-needed shade. Constructed from weather- and UV-resistant aluminum for lasting durability, this cantilever patio umbrella has a sleek black pole and base with a fabric shade on top that will keep family and guests cool and protected from the harsh rays of the sun. Our Beautiful 20" Half Round Umbrella Base Is Useful For Holding Your Umbrella Securely Into Place. It Features Ornate Flower Design With An Antique Finish That Brings An Old World Flare To Any Patio, Deck Or Garden Space. 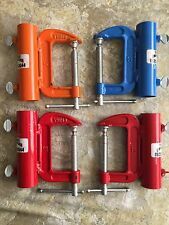 Secures to any bench or bleacher with a 3" C clamp and can fit any umbrella up to 1 1/4” with adjustable thumb screws. The Ultimate Umbrella Holder. 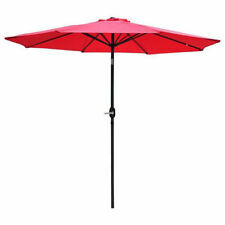 STURDY MATERIAL: Made of strong and durable HDPE Plastic with a weather resistant and UV protective coating, this base is perfect for outdoor use.|HEAVY DUTY BASE: This weighted base fits most offset and cantilever umbrellas, and holds up to 130 lbs. of water or 177 lbs. of sand to keep your umbrella secure.|CONVENIENT MOBILITY: Base includes 2 built-in wheels, so you can easily tilt and transport your umbrella wherever you need shade.|SIMPLISTIC DESIGN: This base is suitable for offset and cantilever umbrellas as well as market umbrellas, and can be used in residential or commercial settings.|EASY TO USE: Built in spout makes it easy to fill and drain at the start or end of the season. 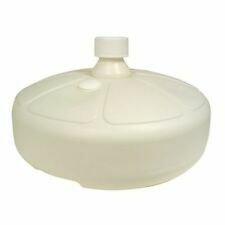 Includes one large filling port at the top of the base, as well as a side port for quick draining. (Fit for 8 Ft or 9 Ft Patio Umbrella. Heavy base holds umbrella stable and safe. Attractive elegant rose decorative pattern and antique finish. x H): 17 15/16" x 12 13/16" (45.5 x 32.5cm). Upright Tube Dia. : 2 3/16" (55mm). Thispatio umbrella base stand is made from rust free composite materials, bronze powder coated finish. Superior construction and classical styling highlight these aesthetically pleasing pieces, which truly are works of art. Provide stability for your patio umbrella with this square umbrella base. This base has an adjustable design to accommodate various pole sizes and fills easily with sand or water to provide weighted support for your umbrella. Available in multiple colors - polyester outdoor patio umbrella, black powder-coated steel ribs and pole - Includes 1 patio umbrella - Base NOT included, fits 1.5" diameter base openings - Wind/heat vent. Adams resin umbrella base will fit 1" to 1-1/2" umbrella poles. this sturdy and durable resin material will not peel, rust, or rot. the uv-inhibitor allows colors to stay bright and attractive in the sun. Color: Black. Net Weight: 22 lbs. Diameters of Upright Tube: 2 3/16" Dia.. Overall Size(LxW): 19 11/16" x 13". Fit for Half Patio Umbrella. Click for Full Description. With an attractive decorative pattern and bronze finish this piece adds charm and elegance to any patio|Includes a hand-turn knob for securing umbrella to the base|Includes a coupler to allow it to fit both 1.5" and 2" diameter umbrella poles|Made of poly resin material|Size: 18" diameter x 13"H.
★ MEASURE YOUR TABLE & UMBRELLA POLE BEFORE ORDER. ★ This umbrella wedge might have a pre-cut seam at one side for better-fit the umbrella pole, and it works fine inside the patio table hole. ▼ Fits umbrella pole diameter 1 1/2 inch (38mm) ; Table hole opening / umbrella weight base hole diameter 1.8 to 2.4 inch (see images). ▼ Twist / rotate the cone wedge to fit in table hole. ▼ Lubricating oil / soap-suds / vaseline / sanding might be helpful in installation. ▼ No more swaying / wobbly umbrella. ▼ Curved (see engineering drawing in second images) Tapered Design keeps the Umbrella properly seated and eliminates any rattles. ▼ Rubber Umbrella Cone Wedge works with any table and umbrella combination, helps to keep the umbrella properly centered over the table..
HIWKLTCLAMPSOCKET Simple Deluxe 1-Pack 12-Pack Clamp Lamp with Bakelite Socket,150-Watt, 6 FT Cord, UL Listed Find many uses around your home or office. Provide extra light in workshops, basement, or garage. Versatile multi-use utility lamps with polished and vented aluminum reflectors Includes ---Clamp Light ---no bulb included DETAILS & SPECIFICATIONS Features ---Rated for up to a 150-Watt Bulb ---Easy Positioning - 6 feet cord and spring Clamp allow for focus light in areas you need ---Multifunctions - Work lamp with spring Clamp provides focused light in areas you need. With an attractive decorative pattern and bronze finish this piece adds charm and elegance to any patio. Made from cast stone, this piece is rust-resistant and made to last for years. - Includes a hand-turn knob for securing umbrella to the base. BCP SKU: SKY4296. Cater to convenience with this elegant addition to the entryway. Modern spherical umbrella stand adds an attractive appeal to any living space. 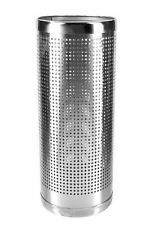 Decorative holder is crafted with umbrella- and rain-drop-shaped ventilation holes. Umbrella Sand Anchor. This handy device ends the struggle of setting up and securing your beach umbrella. Plus, it is a great accessory for surf fishing, as well. The Rio Beach Sand anchor will help you stay in the shade and decrease your risk of over-exposure to the wind, sun, and rain. Mounting blocks are made of white vinyl to match most deck railings. Effectively keep your patio umbrella standing as sturdy as a statue in wind. 1 Umbrella weight bag. Larger sand opening than other models, easy to fill it with sand. If you do not receive our reply within 48 hours, pls. And it can support beach umbrella, flagpole, wedding arch, etc. 1 x Patio Umbrella Base Stand. Can support beach umbrella, flagpole, wedding arch, etc. Easily transport or relocate umbrella base by using the grip handle.